What is it like being an Otaku Developer? Well, for one thing, you'll be using the full potential of the *GB RAM inside your system. Let me explain how much of this RAM is being used by my system. Chrome. The application I spend most of my time on, takes about 1.5Gb of RAM with all my tabs open. And these tabs are necessary to me and I just can't simply close them. My uni website, email, notes, Google+, website project I'm working on, development documentations and news; these must be left open. Moving on, I've got my Windows Explorer running opened in two locations, firstly my uni assignment and secondly my other website project. I can't simply close them either. 61MB. To keep me entertained while I do my work, I've got Windows Media Player playing music in the background. 23MB. As an otaku, I simply cannot stop downloading anything. So I've got Deluge (alternative to uTorrent) running there, downloading the stuff I want to watch in the background whilst I do other stuff. 107MB. If you are working on a website project, you will need to be connected to the web hosting server and so FileZilla (FTP) comes into play. It's opened, ready to deploy any changes I make at anytime. 6MB. And how do I edit these web files? Through the use of a IDE (Integrated Development Environment) of course! Aptana suits my every need in web development and it's happily there running. 200MB. Next up, my uni assignment requires the use of Visual Studio 2012 and that's why it's open. 280MB. I don't know why LoL is open, but I'm just letting it patch. (I probably mis-clicked it or something.) 18MB. Microsoft SQL Server Management Studio is up next. I need it open so I can check on my database tables and see if they are behaving properly. 70MB. So there you have it! 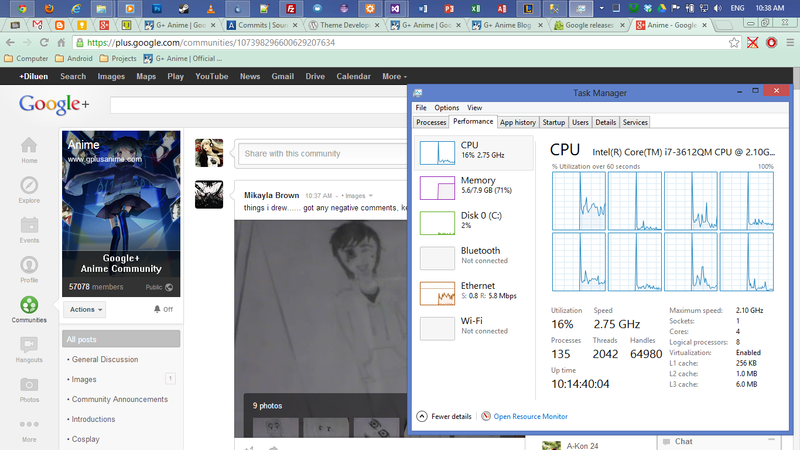 My laptop using up to 5.6GB out of 8GB of RAM. First time I have actually used this much at any given time.